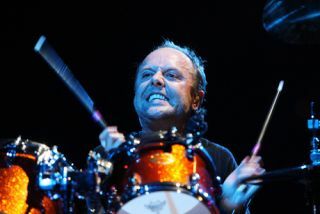 It's been a busy few days for everyone's favourite Danish tub thumper Lars Ulrich. In the past 72 hours he has chatted Orion, a 3D Metallica movie and, of course, Lulu. Up first he spoke to The Pulse of Radio out Metallica's recently-announced Orion Festival. The two-day show will see Metallica close each night as part of a diverse line-up filled with the likes of Arctic Monkeys, Avenged Sevenfold and Gaslight Anthem. Lars told Pulse of Radio: "This whole thing is kind of based more around the classic festivals that we've been playing in Europe for the better part of the last 25, 30 years, which is really about diversity and really about kind of many, many different musical experiences. So that's kind of what we're going for. Now whether anybody buys into that or not, we'll find out, but there's gonna be lots and lots of cool, heavy stuff, trust me." Lars has also let slip plans for Metallica to head to the big screen for a 3D movie. Again speaking to the Pulse of Radio he said: "Getting your own 3D movie off the ground is easier said than done, but we're doing our best and we have a window for that later in the year that we're hoping to still make happen. We just want to make sure that we don't throw ourselves out into something that gets so completely overwhelming that the whole thing just blows up in our face." Of course, we couldn't go a week without more fallout from Lulu. Lars told DC101: "I guess Howard Stern started talking about a song on there last week called 'Junior Dad' and about how wrong he was about the record when he first heard it and about how 'Junior Dad' is this incredibly beautiful song and he listened to it the whole week and he advised everybody to go and do the same. "And I just saw some piece in, I think it was the LA Weekly or something, somebody sent me, talking about how the actual real album of 2011 was 'Lulu', but nobody is gonna recognize it for another 20 years. So, one by one, they're crumbling. In about 900 years from now, people will be able to talk about 'Lulu' face to face with each other without hiding behind masks. So we look forward to that day."